This challenge is actually several challenges in one. The way it is designed is that you work through one level and then move on to the next. It's comprised of five different challenges of 12 books each, or 60 books total. We tried to arrange it in a way that shows what we thought would be the easiest in the first few levels, and then gradually gets harder. We also wanted to spread it out a bit, so the same types of challenges aren't in each level. Ultimately, I think we both wanted a challenge that's going to really make us have to think ahead and plan to complete it. Tress and I are both really into organization and bullet journaling, so for us, this is just an extension of that. I'm not sure what goals Tress has set for herself within the challenge, but my goals are to work it in order and try to see how far I can get. 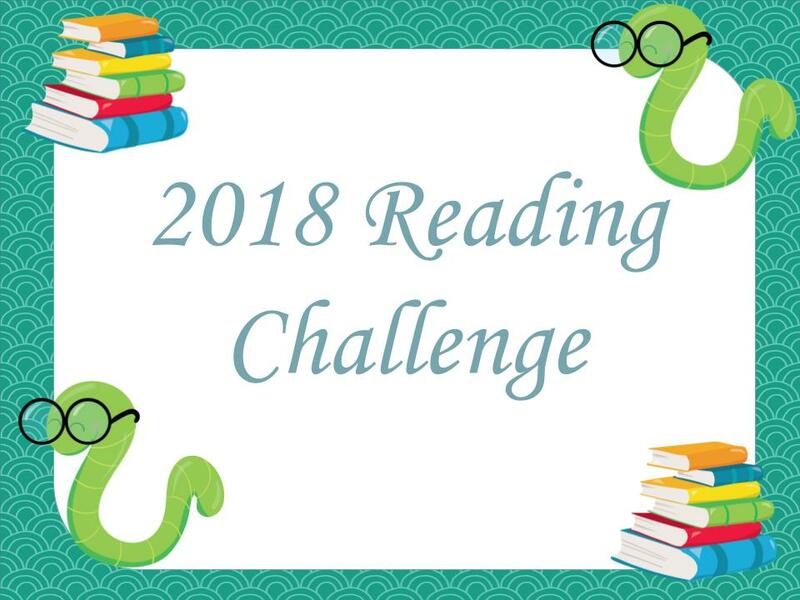 Last year, I kind of read a book and then tried to fit it into a category on the challenge. This year, I'd like to plan ahead and see if I can read more because of it. I've already got some books in mind for some of the items, so I'm really excited to see what I can accomplish on this list. So, without further ado here is Tress and I's reading challenge for 2018. I've also linked a prettier printable version of the table. Special thanks to the husband for making the pdf and html work, because that stuff is so beyond me it's not even funny. This is a really awesome challenge! I think I will definitely try this one out! :) It seems really fun, but also gives a challenge that isn't to impossible. Thank you! I'm glad you like it. I'm really happy with how it turned out, and how it's got different challenges within it. Be sure to let me know how you do on it! Sounds great. Do you absolutely have to fill every category? Hi Jamie! Not at all. We planned it so people can work to how many levels they want, and tried to arrange it from easiest to hardest. I'll probably only get to only the 2nd or 3rd level myself. You could even skip around if you wanted. This is just a fun way to challenge readers. =) Thanks for the comment! Wow! That's a lot of challenges. I'm going to add you to the bloggers I follow tab. Best of luck! I am going to participate in this challenge. It seems like something I could do. I am going to link this post to my blog. I hope you enjoy it! Best of luck on it. I'll link your blog to my page! Thanks, Katie! Best of luck. I'm going to try and get to level two or three myself (three's for sure a stretch.) I'll add you to bloggers I follow! I'll be participating! Here is my blog link! Hi! I'm definitely doing this! It will work for teens, correct? I really fell behind in my reading this last year and this challenge looks like a lot of fun and full of inspiration! Would a Goodreads page work? I don't see why it wouldn't work for teens. The couple of author specific ones might be the only hang up. Currently, I'm just linking other bloggers so other people can find them, however I will be posting my own status updates, you can always comment on those updates as well. Best of luck! Best of luck! You've definitely listed some interesting looking challenges on your page! Adding you to the follow page. Hello, this looks like fun so I'm in! Thanks for hosting! Mave, Thanks for the comment! I'm hoping it will be fun for everyone. It's already making me think about what books I need to read next. I'll get you added to the blogger list! Best of luck! Hi. just wanted to let you know I just have two books to go! And I wanted to ask if you will be having one of these challenges next year? Jamie, that's awesome! You are way ahead of me. I will be making another challenge and posting it sometime in December. Done now! Excited about next year! Jamie, that's awesome! My Reading Challenge partner in crime and I just started working on 2019's! It'll be a similar format but with more challenges! Thank you, that's very kind of you to say! Just realizing I never made an initial post about joining in this challenge. If you are interested in seeing how far I got or what books I chose, I've included the links below! No worries! I'm enjoying seeing what you read. How was Practical Demonkeeping by Christopher Moore? I really enjoyed his book Fool. Excellent choice in Storm Front. Both Tress and I are huge Dresden fans! Thank you for reading my book blog. Please feel free to leave a comment to further or start a discussion on the book reviews and other posts. If you have a book recommendation for me I'd love to hear it! Share book reviews and ratings with Linz, and even join a book club on Goodreads.